Merging data with ADD FILES can result in nonsensical data. This occurs when variables or values have different meanings over files. By comparing dictionaries over files, inconsistently coded variables are quickly detected. When files are merged with ADD FILES, inconsistent dictionary information is discarded. This will happen, for example, if a variable v1 means "gender" in one file and "employment status" in another. In this case, values indicating gender will seem to indicate employment status or vice versa. For a demonstration, see SPSS Add Files - Cautionary Note. Put the files you'd like to merge in a single folder. Make sure there's no other .sav files in this folder. Make sure you have the SPSS Python Essentials installed. Download and install SPSS Dictionary Checker. Note that this is an SPSS custom dialog. Go to Utilities Search Syntax Files. Copy-paste the path to the data folder into the dialog and select whether you'd like a syntax file with a "save list" of variables to be written. Click Paste and run the pasted syntax. Clicking the tool's Help button will take you to this tutorial. We very much appreciate your feedback on it. This command will always produce a new dataset presenting an overview of the dictionary comparison. Each row represents either a value or a variable with value labels and variable labels over different source files. Empty cells indicate that either the variable wasn't present in one or more source files or no label was defined. Value inconsistencies (val_incon) is (the number of distinct labels - 1). Empty cells are not counted as distinct labels. Variable inconsistencies (var_incon) is the sum of all value inconsistencies for each variable. Variables are sorted in descending order according to variable inconsistencies. That is, the "worst" variables are moved to the top of the dataset. Variables with zero variable inconsistencies are removed from the overview by default. Fully consistent data files, therefore, will result in an empty new dataset. The command is case insensitive. All labels are converted to lower case before comparing them. The dictionary check may write a new syntax file containing all consistently coded variables. The file is called "savelist.sps" and will appear in the source data folder. If this file already exists, it will be overwritten. Before use, variables can be added to or removed from this "save list". In order to use it, first merge all files and then run this syntax file over the result. It will drop all variables that are not in the "save list". This is a rather old tool so I'll perhaps remove it altogether. 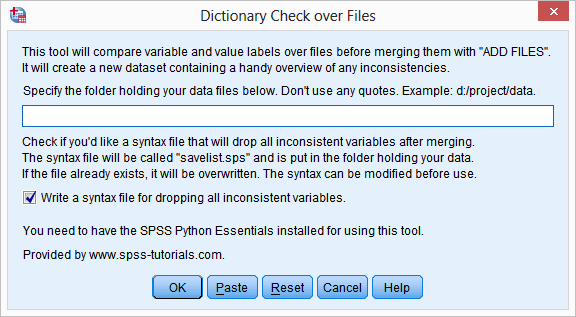 Recent SPSS versions have an extension for this if the SPSS Python Essentials have been installed. Like so, many of my tools have been added to SPSS -without crediting me for the ideas by the way but that's a different story. I'm not sure exactly which extension compares dictionaries, perhaps Utilities => Process data files. You're right about the copy-paste error in the tutorial. Two issues. First is I am unable to get this to run run. The last line of the output reads: "AttributeError: 'NoneType' object has no attribute 'lower'" Also, no other files are created in the directory. Go to Utilities SPSS Menu Arrow Search Syntax Files. Do you really mean to say "Search Syntax" over "Dictionary Check Over Files"
BTW - This is a wonderful resource.